Posted on Wed, Dec 28, 2011 : 5:59 a.m.
After 12 games, the Michigan football team's lineup is mostly settled. But coach Brady Hoke likes to encourage job battles as a way of keeping players sharp, and there are sure to be a few of them as the Wolverines (10-2) regroup today in New Orleans for their first practice since last week. They will play Virginia Tech (11-2) on Tuesday in the Sugar Bowl (8:30 p.m., ESPN). Hoke already has formally opened the punting duties to starter Will Hagerup and freshman Matt Wile, but the fiercest competition might be at free safety, where Thomas Gordon and Troy Woolfolk continue to battle for playing time. Thomas Gordon is battling with Troy Woolfolk for the starting free safety role. Gordon began the season as the starter and played extremely well, including leading the team in turnovers. He forced four fumbles — the most in the Big Ten — recovered two others and had one interception. He also had 59 tackles, third most on the team, and combined with fellow safety Jordan Kovacs to not allow a 40-yard play while the full-time starter. However, the emergence of freshman corner Blake Countess — and, to an extent, Woolfolk's poor play there — led the coaching staff to slide Woolfolk to safety, where he started in front of Gordon in three of the final four games. Gordon didn't play a single down against Iowa, and the two split time down the stretch, even though Gordon outperformed Woolfolk in games. Hoke said he went with Woolfolk because he outperformed Gordon in practices. Yet, when Michigan needed a stop late in the final moments against Ohio State, and the Buckeyes likely to pass because they were trailing, the Wolverines went with Gordon. Woolfolk, meantime, was culpable for two long touchdown passes in the first half. So, who gets the call against Virginia Tech? That likely will be determined by their performances during this week's final stretch of practices. All but two of them will be held at Tulane University, including today's workout. Freshman Matt Wile, above, is pushing Will Hagerup for the starting job. Hoke has acknowledged the competition here, and said he won't name a starter until a couple of days before the game. 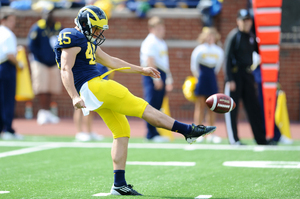 Hagerup was a star as a freshman last year, when he averaged 43.6 yards per punt, the second-best clip in school history. But he's experienced a precipitous decline this season, which began with a four-game suspension to begin the season. He averages 36.8 yards per punt, nearly 7 yards off last year's mark. His longest boot is 50 yards, which he exceeded 10 times last year. Michigan was the worst punting team in the Big Ten this year. It's impossible to gauge how much of Hagerup's struggles can be ascribed to his suspension, but there's no question his leg has lacked the explosiveness it had last year. Wile, meanwhile, performed at a high level while filling in during Hagerup's suspension. The true freshman, who also handles kickoff duties, averaged 41.1 yards per attempt and had two 50-yarders in four games. There's no question Wile has performed better than Hagerup this year. Whether he starts will come down to how much Hoke values Hagerup's experience in a BCS game on a national stage. Roh has started all 12 games this year at weak-side defensive end, and he'll do the same against the Hokies. But he continues to split time with Black, who has come on strong this season. Roh is a three-year starter, but Black's evolution has cut into his playing time. Although the starting spot is settled, the rotation is not. Black could make a case for more time with a strong week of practice. It'll be interesting to see what the coaching staff does with Roh and Black in the off-season. Both have progressed throughout the year, and one could be split to the strong-side to get both in the lineup and shore up depth concerns due to graduating three of four starters up front. The left guard spot is expected to go to Schofield, who performed well in nine starts this year and might be the favorite to claim the position full-time going into next season. 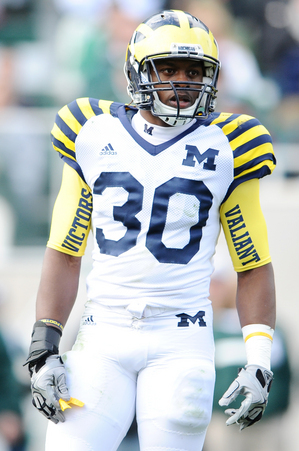 "I think he’s grown," Hoke said recently. "I think he’s improved. I think he’s really obviously better than he was at the beginning. But I think Michael has just really scratched the surface of how he can play offensive line at Michigan and that standard." However, Barnum has remained the listed starter on the depth chart for every game this season and is highly thought of by the coaching staff. If his ankles are healthy, he could make a push to crack the rotation, even if Schofield is the primary option. The coaching staff has raved all year about Morgan, who might have started at weak-side linebacker sooner if he hadn't suffered an injury in fall camp. But when he was hurt, it was Hawthorne who got the bulk of the time to open the season. He started fast, including recording six tackles against Notre Dame and 10 against Eastern Michigan, before tapering off. Morgan overtook him for the Purdue game, and he's been the guy since. "He’s always been very physical," defensive coordinator Greg Mattison said recently of the true freshman. "He’s a real willing football player and, now, he’s starting to make the transition of you don’t just run into the guy every time, your job is to make the tackle. He’s started to figure that out. "He’s been a guy that’s gotten better and better and better." Morgan is expected to start against Virginia Tech, but coaches have shown they are comfortable going with Hawthorne if the freshman struggles. He was pulled from the Notre Dame game after a mistake-riddled start, and left for a stretch against Iowa before returning. Wed, Dec 28, 2011 : 7:18 p.m. I hope and expect Troy Woolfolk to start at safety in the Sugar. Brady Hoke has said the best players will play, but there has to be an asterisk in there when it comes to a guy like Troy. He stuck with the team when it was at its lowest, suffered devastating injuries, and was still probably one of the most vocal, upbeat leaders on the team. The type of injury Troy suffered takes longer than a year to recover from, so he's probably still not at his best, but he's showing the way in practice. Thomas Gordon has the tools to be a great player for UM the next couple years. Let Gordon have plenty of playing time, but Troy deserves to start in the Sugar Bowl. Wed, Dec 28, 2011 : 5:38 p.m. Wed, Dec 28, 2011 : 4:56 p.m.
Theo212 vs Theo's brother 1) a block of concrete, or 2) an orange construction barrel. Hoke's poetic comment: &quot;Theo really has come a long, long, long way From being brainwashed in WCIMFH's day Now he is pushing Theo's brother real hard For a starting spot in our lineup card From being a decommit to a mainstay&quot; GEAUX BLUE! Wed, Dec 28, 2011 : 4:05 p.m.
Hope Wile starts. Seems as tho Hagerup is doing everything he can to waste his talent and $20 grand a year scholarship. Actually I wouldn't Mind seeing Wile replace Brendon Gibbons as well. After reading that he jilted a waitress out of a tip cause she pointed out how lousy he was his freshman year (due in part Gibbon's partying and late night's his freshman year). I personally want him to return his scholarship money for that year to the suffering people of the state of Michigan. Wed, Dec 28, 2011 : 3:33 p.m.
A comment has been removed because it was off-topic. Wed, Dec 28, 2011 : 2:33 p.m.
Michael Schofield vs. Ricky Barnum 1) a block of concrete, or 2) an orange construction barrel. Is it possible to trade the U-M Alumni Association-organized prize package valued at approximately $4,200 which includes Luggage handling, porterage at the airport and the hotel, Optional tours, outings and excursions, Luggage tags, document wallet and engraved Sugar Bowl name badge for a trip to the Heisman ceremony?? Wed, Dec 28, 2011 : 3:50 p.m. If you think these guys are slow check out Ondre Pipkins highlights. I got a feeling he's gonna be the converted QB in 2014. Wed, Dec 28, 2011 : 1:41 p.m.
Competition makes everyone better. Both sides work harder and it creates depth. When the coaches believe they can go with either guy, it gives any ball club confidence going into the next game. GO BLUE!!! P.S. Theo, have you ordered our tickets yet??? I know the King isn't coaching anymore but I am not missing this year's bowl game due to your negligence!!! Anyhoo love you bro and I'm ordering pizza for dinner tonight! Wed, Dec 28, 2011 : 3:18 p.m. Wed, Dec 28, 2011 : 1:57 p.m.
Yep, coach Hoke is just like mom: let the best guy eat. Ordered the tickets. DonAZ, 1st down, lorain, and meangoblue2 will be joining us! Mom says we still have to be in when the streetlights come on, though. Happy New Year! Triple anchovies, please. Wed, Dec 28, 2011 : 1:27 p.m.
per brady. let the better person play. that is what he has been saying all year. with one game left i think you will see this happen. this is how bad michigan wants to win the sugar bowl. i say let it all hang out. go blue. Wed, Dec 28, 2011 : 2:36 p.m.
Brady has also said the team is about the seniors. Given that Woolfolk is a senior, and the son of Butch, I'm guessing the coaching staff has had a soft spot for him. Wed, Dec 28, 2011 : 1:18 p.m. I have to say, the play of Troy Woolfolk this year has been very disappointing! He looks no different this year than 2 years ago or 3 years ago. A guy that cant cover, that dives at guys with his head to tackle, and in general makes a negative impact on the game when ever he is in! I understand the premise of starting guys that play well in practice but when it never translates to the field in game situations then I think you really need to re-evaluate why he is playing, especially with a player that may not be the best practicer but is much better in games! I dont know about Morgan. I personally have not seen anything in games that is spectacular or above average even. Roh was non existant for the first 4-6 games of the year but has been playing better and I would not mess with the Dline the way it has been playing since the Iowa game! A simple solution to the punting situation is dont have to punt! Score every time you touch the ball! Ok maybe thats not a simple solution. Go Blue!!! Wed, Dec 28, 2011 : 4:51 p.m.
agreed Chiro19.. I attended a couple of high school games of Desmond Morgan here in the West Mitten. He played both sides of the ball, Middle Line backer on D,and QB on offense. He was very athletic,and a stud on D, man against boys at times. At QB the team had designed QB runs,and he was Tebow like,and would just lower his helmet and bowl people over. He has the size,and will be bigger next year.I think its just a matter of playing time,and learning process in how to play B1G football. G Matt will have him playing to a higher level in no time.,and will be a standout player for the next 3 yrs,he is a True freshmen. Wed, Dec 28, 2011 : 2:41 p.m. I understand having to trot Woolfolk out there when Kovacs sat out with an injury but my gawd, as soon as Kovacs was healthy it should have been Woolfolk taking a seat, not Gordon. To that point Gordon and Kovacs looked to have a real chemistry and could about read each other's mind. For whatever reason Woolfolk and Kovacs don't seem to have that same chemistry. Wed, Dec 28, 2011 : 1:15 p.m. Thanks to Borges, the real position battle will take place in a year or so. At quarterback: 1) a block of concrete, or 2) an orange construction barrel. Anyone who has been paying attention to the bowls has seen that dynamic offenses (Missouri, etc.) are taking home the prize. Defense, as it should be, is just an afterthought. Like Lloyd did in his last game vs Florida, let's hope that Borges gives our boys some room to play vs the Hokies. Go Blue! Wed, Dec 28, 2011 : 10:14 p.m.
@ #58ontheroster. What does defense have to do with having to settle for a bad offense. Btw the term defense wins championships is a myth. Offense is just as important. Wed, Dec 28, 2011 : 10:09 p.m. Recruiting is showing were this offense is headed and it does not bode well. The 2 WRs that have recently committed are tall ,big and slow wideouts that don't do much after the catch. Looks like Hoke and Borgess are perfectly ok with boring us with the same offense Carr used. Wed, Dec 28, 2011 : 7:59 p.m.
Scott I've been wondering all year if Brady and Al wouldn't change their preconceptions and start recruiting QBs who can run, and keep developing ths &quot;spread west coast&quot; offense. I don't want to return to the days of 28-sack-a-year-never-run-QBs. If we fans would remember, we were tired of playing at a disadvantage as other schools would abuse us with mobile QBs. Now we're almost taking for granted having the best multi-threat QB. Wed, Dec 28, 2011 : 3:39 p.m.
&quot;A block of concrete or an orange construction barrel&quot;. That does bring back memories. Oh man, is their going to be a drop off in scoring and excitement once Denard leaves; then once Gardner graduates it's time to start falling asleep during Michigan games again . Lloyd Carr offenses were the equivalent of 2 pounds of Turkey and a glass of warm milk. Wed, Dec 28, 2011 : 3:16 p.m. Wed, Dec 28, 2011 : 2:57 p.m. Isn't it true that Michigan didn't start winning convincingly until the DEFENSE started playing like a Michigan defense should? RR had a dynamic offense and barely beat Indiana and Minnesota. RR's &quot;dynamic&quot; offense couldn't even score against the better Big 10 teams, let alone a mid level SEC team. As far as I'm concerned, the spread offense is for untalented, or under talented, teams that can't compete otherwise. Defense always has been, and always will be, the mainstay of any championship team. You would see that if YOU had been paying attention. Wed, Dec 28, 2011 : 2:20 p.m.
Yeah and that &quot;block of concrete&quot; Chad Henne had quite a day in that bowl game. Especially because he was finally healthy.